My favourite pizza toppings, not 4 cheeses, but FIVE with porcini all on a freshly homemade pizza base. What else could you want? 1. Preheat the oven at 250C degrees. 2. Sprinkle a portion of flour over your kitchen bench and spread it using your hands. 3. 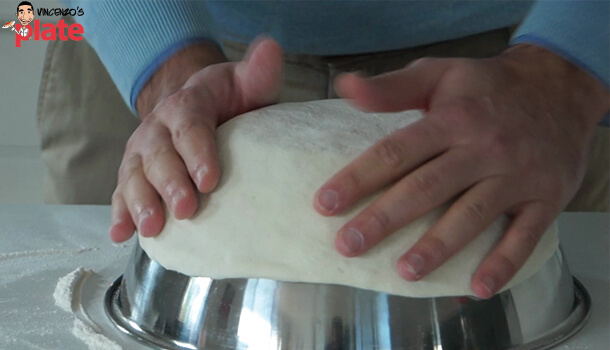 Place your dough on top of the board and using the tips of your fingers press down on it, not too hard, but don’t be shy! 4. Press down through the middle and spread the dough out. Once you have formed a circle with lots of bumps in it, turn it over, sprinkle a little more flour on the board and place it back down. You can then spread some flour on top and repeat the process. 5. Stretch the dough out slightly using your hands, turn it once again and add a little more flour. 6. Then, if you prefer, use a rolling pin and start to stretch the dough out some more. Roll it all the way forward, then bring it all the way back. 7. 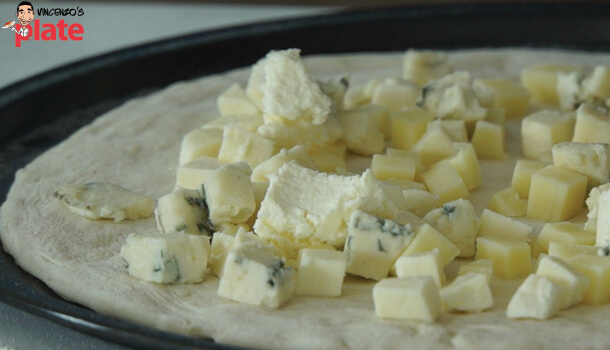 Flip your pizza dough and repeat this process. 8. To make these even easier, get your mixing bowl, turn it upside down, pick up your dough with both hands and stretch it over the top of the bowl. 9. Now, carefully stretch parts of the pizza dough down using just the palm of your hand and turning the bowl around slightly bit my bit. 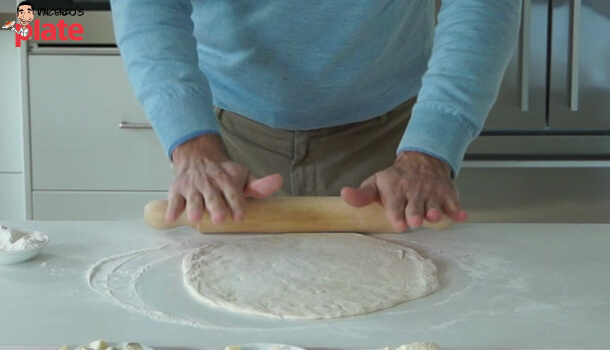 Or, if you prefer, you could use a rolling pin to stretch the dough out. Rolling it all the way forward, then back. 10. Remove the pizza base from the base of the bowl, move it from one hand to another and place it on the tray, flattening it one more time gently with the palm of your hands. 11. Cut the provolone, gorgonzola and fior di latte cheeses into small cubes. 12. 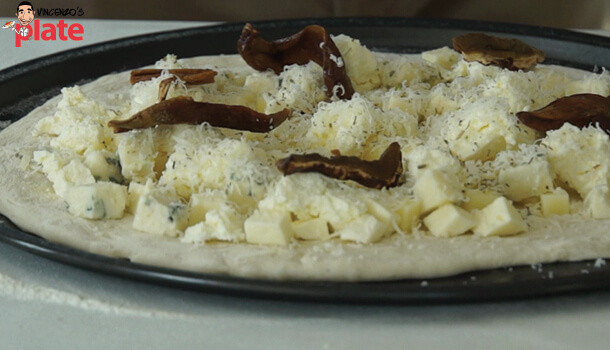 Add the provolone cheese to the pizza base first, then the gorgonzola and fior di latte Mozzarella. 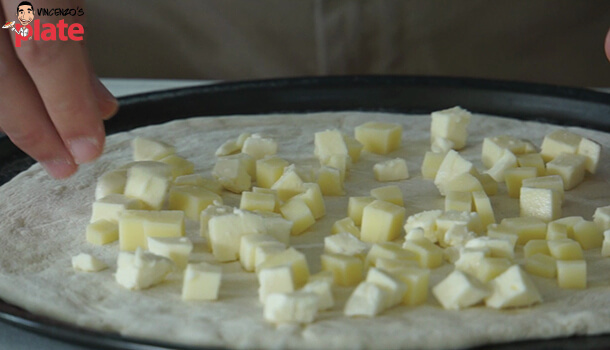 TIP: Remember to leave a rim around the dough without ingredients on it and this will create the pizza crust and make sure the cheese doesn’t spill over the side when it is cooking. 13. Scoop up small amounts of the ricotta using a tea spoon and layer them on top of the other cheeses, so that the entire base is covered. 14. 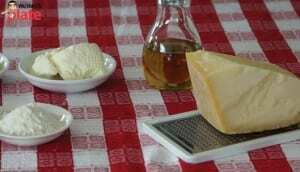 Grate the block of Parmigianno cheese over the entire pizza. 15. 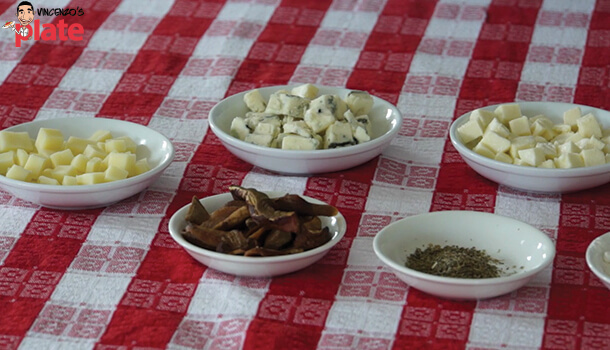 Sprinkle some herbs over the cheese pizza also, careful not to use too much. 16. Add the porcini mushrooms to the pizza, one at a time, making sure there is AT LEAST one mushroom per slice so no one misses out! 17. 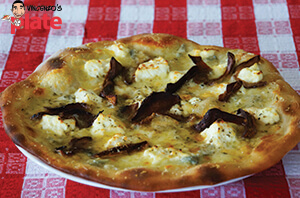 Drizzle no more than a tablespoon of extra virgin olive oil over the pizza. 18. Now, put your cheese pizza in the oven which should be nice and hot by now at 250C degrees for ten minutes. 1. Slice your pizza into portions and place onto a large chopping board or into individual plates.